High height resolution GPS sonde measurements have been utilized to understand the characteristics of internal inertia gravity waves (IGWs) over a low-latitude station Trivandrum (8.5°N, 76.9°E) during an intensive campaign “Research on OrganisatioN of Atmospheric convection (RONAC), which was initiated to understand the organization of convective systems during the Indian summer monsoon (ISM). GPS sondes had been launched at every 3 hourly intervals for a period of 10 days before the onset of ISM from 23 May to 1 June 2012. This unique dataset is utilized to understand the characteristics of IGW over this latitude where the effect of the Coriolis force is minimum. Observations show that the onset of tropical easterly jet (TEJ) was established well before the onset of ISM. Internal IGW activity with ~ 78 h periodicity associated with TEJ was observed in the upper troposphere and lower stratosphere (UTLS) regions. We have reconstructed the time series of winds to understand the propagation characteristics and employed Stokes parameter method to extract the other wave parameters. Vertical and horizontal wavelengths of ~ 2.3 km and ~ 2620 km were observed, respectively. The significance of the present study lies in the characterization of internal IGW over Trivandrum for the first time, which will be an important addition to the present understanding of the IGW and hence to the gravity wave community. 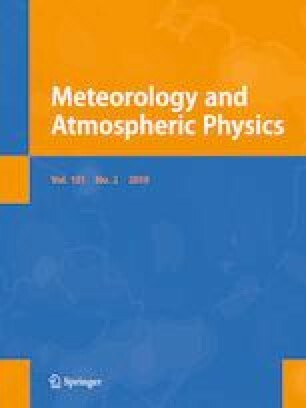 The authors acknowledge all the scientific and technical staff of the Space Physics Laboratory (SPL) and Meteorological Facility, Vikram Sarabhai Space Centre, Trivandrum, who participated in the RONAC campaign. Thanks to Dr. Radhika Ramchandran, Director, SPL for her constant supports extended during this study. Authors gratefully acknowledge both the reviewers and Editor-in-chief for their valuable comments and suggestions for the improvement of the manuscript. RONAC campaign data can be obtained on request to the Principal investigator. The bars indicate the time average, i.e., averaged over a number of independent spectra to remove the effects of incoherence motion and A is a scaling constant. Here the parameters I and D quantify the total variance and its axial anisotropy. The quantity P is the ‘in-phase’ covariance associated with linear polarization, and Q is the ‘in-quadrature’ covariance associated with circulation polarization. It is also to be noted that if δ = 0° or 180°, then Q = 0, which indicates linearly polarized wave, otherwise if δ = 90° or 270°, then P = 0, which indicates circular polarized wave, and anything in between indicates elliptical polarized wave. Serafimovich et al. (2005) discussed that any partially polarized wave motion can be described completely and uniquely in terms of the Stokes parameters as it averaged over time and vertical wave number band.